Everyday Q&A: How do SSRIs work? For a chemical whose effects are so fiercely debated, bisphenol A is practically everywhere. A great deal of food packaging contains BPA, and the substance can then leach into food. From an industrial perspective, BPA serves a vital role, and there is no suitable replacement. For the past 50 years, the FDA has insisted that the amount of BPA that gets into food is safe. Scientists, on the other hand, continue to investigate the chemical. A team led by Dr. John Elsworth, senior research scientist in the psychiatry department at Yale, has uncovered a specific potential danger of BPA. Elsworth’s study explored the possibility that this omnipresent chemical might affect working memory. Up until now, no participant in the safety debate had considered that BPA might impact intelligence. Elsworth’s findings suggest that we have much more to investigate. The study built on the work of a colleague, Csaba Leranth, professor of neurobiology and of obstetrics, gynecology, and reproductive sciences. Researchers began by exposing male monkeys to the typical levels of BPA found in humans. After consistent exposure to BPA, the monkeys showed significantly worse performance on a simple working memory task. Elsworth’s team went beyond a level of behavioral analysis to examine the effects of BPA on the brain. “The pharmacological mechanisms responsible for BPA’s actions are not fully understood, but it is clear that it disrupts the action of several hormones, including estrogen,” Elsworth said. Anatomically, the hippocampus and prefrontal cortex are both strongly implicated in working memory. These regions contain many neurons that are covered in asymmetric spine synapses, which are points of excitatory transmission between neurons. Neuroscientists theorize that memory is a product of modifications to neural networks – storing information in the brain requires rewiring certain synaptic connections. In order to have a properly functioning memory, it is essential that asymmetric spine synapses are available for altering. In addition to worse performance on working memory tasks, BPA caused a decrease in the number of asymmetric spine synapses in the prefrontal cortex and hippocampus of monkeys. Fewer spine synapses implies that the brain is less able to form new connections in response to new experiences. In essence, the brain has an impaired ability to learn. Surprisingly, after the exposure ended, the monkeys regained normal working memory ability, but further is needed to fully elucidate the recovery. Elsworth’s findings provide many reasons to reevaluate the plastic industry’s choices. Negative effects of BPA in monkeys appeared at same “safe” low levels that most of us have circulating in our blood right now. Furthermore, monkey brain anatomy and structure is strikingly similar to that of humans, which suggests that the human brain may respond to BPA in a similar way. “These results suggest that some people could really be experiencing some level of working memory disruption as a result of BPA exposure, and the effects of BPA may well be more dramatic and long-lasting on the developing brain,” Elsworth said. 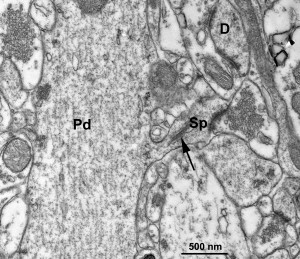 An electron micrograph shows an asymmetric, excitatory synapse on the spine of a pyramidal cell’s dendrite in the hippocampus. Spines are protrusions from a neuron’s dendrite, which typically receive input from one excitatory synapse. Image courtesy of John Elsworth. In the future, Elsworth plans to explore the possible effects of BPS, the chemical substitute used for BPA in BPA-free products. However, his current work has already made clear that we lack the necessary scientific knowledge to make smart, safe decisions about substances encountered in everyday life. Cover Image: BPA is found in most water bottles and many other types of food packages. Despite its ubiquity, there is insufficient scientific evidence to prove that this chemical is safe. Image courtesy of Plastics Today.